The idea to combine words and music first came to me thanks to a happy incident which brought me together with the great drummer Vladimir Tarasov, in the happy summer of 1989, on board of the cruise ship Taras Shevtchenko in the Mediterranean. It was magical! We performed a lecture entitled "The Drum and World Culture" and held a number of events including "Pushkin in Africa", "Perebroika" (with Chekasin) and others. As a result of all of this, in 1997 I held in my hands my first CD "Silence" based on my road novel "Disclosure". The composition "Silence" was first performed partially in Vienna, as an illustration to my lecture "On Freedom and Happiness in the Stalinist Era" (on Palm Sunday 12.3.1994), once again with Vladimir Tarasov. We were united with Alexander Alexandrov on the 5th of May 1996 (Printers Day) in Karlsruhe, and a fabulous avantgarde festival organized by the Hoepfner Brewery, in a section of their factory, full tubs of shining domes, just like a temple. Then we performed at the "Japanese Birthday", an event held at the Central House of Journalists in Moscow on 27.5.1996 and in New York at a festival held in memory of Kuryokhin in January 1997. On the 27th of May some friends came to St. Petersburg to wish me a happy birthday - an odd assortment of instruments: drums, bassoon and double bass (V.Tarasov, A. AIexandrov and V. Volkov - which turned out to be a perfect line-up to combine with a voice. Initially we performed some of my poetry. On the 20th of June a fabulous group of musicians got together in Moscow to celebrate Vladimir Tarasov's 50th birthday. This coincided with a time of mourning: it had been 9 days since the death of one of our great poets and singers, Bulat Okudzhava. Just before the concert we improvised something of a requiem. This was our test. On the 10th May 1998 at the Cami Hall in New York, at the closing of an international jazz festival in memory of Sergey Kuryokhin, our "Pushkin Band" was born. We were taking chances. I decided not to perform my own pieces, which I felt we'd mastered more or less, and instead arrived with a piece called «The Hour of Sad Choices", put together from various rough drafts of poems by Pushkin. A day earlier, Alexandrov and I wrote out a "score" on the train from New York to New Haven, and we went on stage without a single rehearsal (drums, bassoon and Yuri Parfenov on trumpet). Pushkin saved the day! The energy and rhythm of his rough drafts inspired the musicians. The English speakers in the audience reacted favourably to our performance, hearing it purely as music. The Russian speakers in the audience had the additional surprise of hearing unexpected and unknown (to them) poetry by Pushkin. Encouraged by our success, we played in St. Petersburg on 27 May 1998 (unfortunately without Tarasov). It was St. Petersburg City Day, the Bronze Horseman statue could be seen from the window, and we performed the introduction to the eponymous poem. The next time we met was not until the 2nd of October, in a mini-version of the group, at the launch of Tarasov's book «Trio» at the Lithuanian embassy in Moscow. V.Tarasov, A. AIexandrov and I performed "Demons". On the 1st of November, at a lovely exhibition of children's sculptures dedicated to Pushkin, in Moscow, we played a mixed selection (with Zhukov replacing Tarasov). 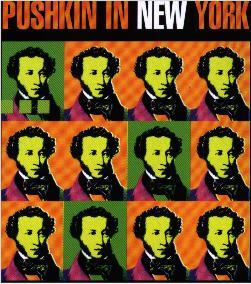 We're all professional tramps, and it's hard for us to coincide in time and space (especially with the Lithuanian Tarasov), but we have faith that we'll get to «play Pushkin» again, and not just once. Andrei Bitov together with his friends-musicians A. AIexandrov, Y. Parfenov, V. Volkov and V. Tarasov, who call themselves "professional tramps", remake Pushkin's poetry masterpieces. Every public performance essentially becomes a celebration of Pushkin's jubilee because it touche and revives not only the memory of the poet but also unity with him of everyone who hears, feels and thinks. The Enlightenment came. By the 200th anniversary we've decided to give new life to the moments of the genius lines' creation instead of regular publishing of the poet's collected works. From words presence of the astonished "client". It's more evident than "hard ringing gallop" of the next monument, it's pure spirit. It's not abstruse, certainly. But it's interactive, for sure. What else can the companies like independent "Long Arms" records and Group of Companies IMA, with their own public and image, famous for their outstanding culture actions, do? Among their professional interests are: art and politics, economy and business, advertising and design, perfect technologies and psychological novelties. All that makes up for an improvised "cocktail on the rocks" which blows up chaos and harmonizes consciousness for the sake of SUCCESS. IMA Group of Companies improvises and makes poetry out of ordinary words and wishes of their clients. That is why this project has become part of two creative firms' activity. 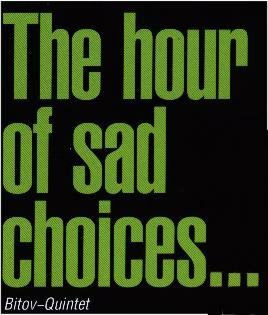 "The hour of sad choices..." is the first unusual experience, the first release of "WORD & MUSIC" series. It's a lucky chance that it's so "Pushkin-like" and that the joint idea of "Long Arms" records and IMA Group is realized.